Athens. Rome. Jerusalem and Vicinity. Peninsula of Mt. Sinai. 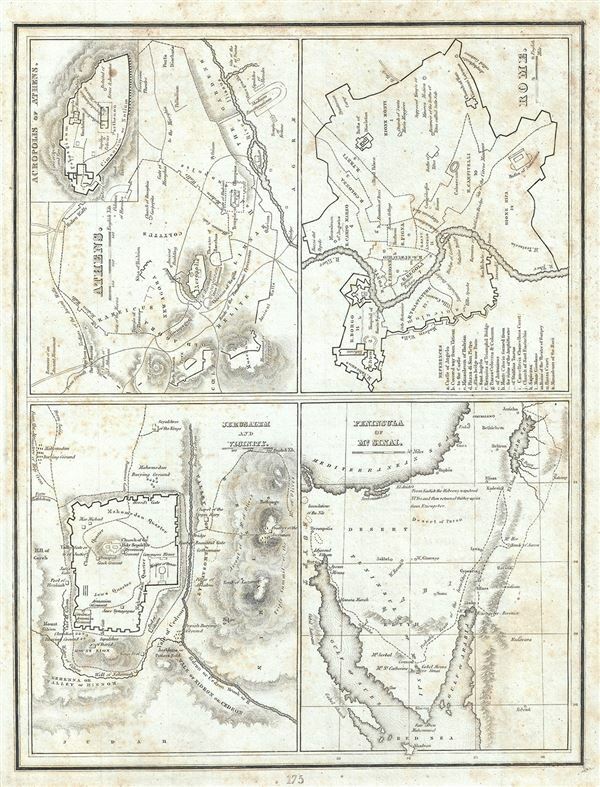 This is a scarce 1835 map or plan of the ancient cities of Athens (Greece), Rome (Italy), Jerusalem (Israel) and the Peninsula of Mt. Sinai (Egypt) by the important American mapmaker T. G. Bradford. Essentially four maps on a single sheet, each map is highly detailed and beautifully depicts the ancient regions. Athens, capital of the Athenian empire, was the heart of Ancient Greek culture and the quintessential Ancient Greek city state. It was here that Greek philosophy and literature as well as the concept of democracy first evolved. This plan of Athens, based on excavations and ancient sources offers impressive and accurate detail. Depicts the ancient wall and its vestiges as well as the modern walls. Notes the ancient city's most important buildings and monuments, including the Temple of Theseus, the Stoa of Hadrian, theatre of Bacchus, etc. An inset in the top right quadrant of this map details the Acropolis of Athens. The Map or plan of Rome depicts the 'Eternal City' in great detail. Known as the birthplace of western civilization, Rome was the capital of the Roman Empire. The map details the city within the modern wall, labeling important ancient buildings and sites including the Colosseum, Site of the Circus Maximus, the baths of Diodetian, the Pantheon and others. Vatican City is also included. A key identifying 15 ancient sites is included in the lower left quadrant. The third plan depicts Jerusalem and its vicinity. Here too Bradford notes important ancient sites and monuments including the Sepulture of David, King's Pool, Mount Zion, Pillar of Absalom and others. The forth map depicts the Sinai Peninsula and notes the 'Probable route of the Israelites' as they fled out of Egypt, across the Red Sea, and subsequently spent the next forty years wandering in the Sinai before migrating into the Promised Land by crossing the Jordan River just north of the Dead Sea. The map was published as plate no. 175 in Thomas G. Bradford's 1835 Comprehensive Atlas Geographical, Historical and Commercial. Bradford's atlas, published in 1835 was an important work on many levels. First, it was one of the first American atlases to follow an encyclopedic format, offering readers extensive geographical and statistical tables to supplement the maps themselves. Second, it was published in Boston and influenced the city's rise as a publishing center later in the 19th century (at the time most publishing in the United States was restricted to New York and Philadelphia). Third, this atlas was the first to contain a separate and specific map showing the Republic of Texas. Fourth and finally, Bradford's atlas in some instances broke the Euro-centric mold regarding atlas production. Among other things, Bradford focused his atlas on the Americas and abandoned the classical decoration common in European atlases in favor of a more informational and inherently American approach.